April 3 - RSVP for April 6 Minyan, Hosting or Looking for a Seder? In Gmail, click "VIEW ENTIRE MESSAGE" in lower left to see entire email. 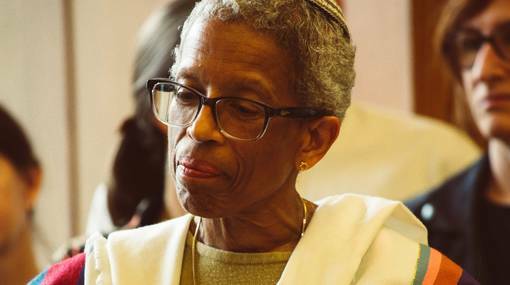 ​​​​​​​Community Minyan with Michele Goldschmidt, Saturday, April 6, 10:00 am – Havurah is hosting a Shabbat morning service and oneg in appreciation of Michele Goldschmidt, recognizing her generous gift of sharing her Jewish learning with our congregation. Please join us for song, prayer, and a community farewell. Questions? Contact Susan Brenner, brenner@hevenet.com, or Shelley Sobel, shelleysemail2@yahoo.com. Please RSVP below so we know how many people to serve at the oneg lunch following the service. Thanks! The Famous Havurah Cookie Table needs cookies for the oneg celebrating Michele Goldschmidt. If you can bake, please bring your cookies (3-4 doz.) plated (if possible) to the Havurah kitchen on Friday (all day) or Saturday morning. Label your cookies with GF, V, or Nuts and "4/6-Michele." Questions? Contact Fran Berg at bergfr@gmail.com or 503-757-4839. Tot Shabbat, Saturday, April 6, 10:30-11:30 am – Children (0-5) and their parents celebrate Shabbat with singing, movement, blessings, and storytelling. We touch on the main highlights of the Shabbat service: wonder, fun, song, listening to the world, dancing, and Torah. Afterward we enjoy an informal oneg nosh and the chance to play and schmooze. Please bring something to share at the oneg. Led by Rabbi Benjamin. RSVP here by April 3. Creating Enjoyable Family Seders, Saturday, April 6, 3:10-4:30 pm – Pesach (Passover) begins on April 19, the next full moon. It is a rich, multi-sensory, multi-themed, many layered holiday. But it can be easy to get lost in some of the details of it. This workshop will help us focus on the meanings of Pesach and how to create inclusive, enjoyable, memorable seders in our homes – and what we can do to lead up to the seder. RSVP here. This article is also helpful. (2) Mikvah Learning Session, Thursday, April 4, 6:30-8:00 pm, MJCC – Spring is a good time for Mikvah! Havurah will be doing its second Mikvah Learning Tour on Thursday, April 4, led by Deborah Eisenbach-Budner. Please join us as we visit the brand-new community mikvah, Rachel’s Well, and consider how engaging with this ritual can enhance our Jewish lives and identities (no immersing this time). We will also welcome in the month of Nisan, during which we celebrate Pesach (Passover), which is considered a Jewish New Year. One of Passover’s four names is the Holiday of Spring. So, we will be touching on the renewal of spring and the redemption of Pesach. Maximum of 12 people can enroll. Please RSVP here so we can send you directions. Above is a photo of the mikvah taken by Benjamin Ariffe. (3) Death Cafe at Havurah Shalom, Sunday, April 7, 10:00 am-12:00 noon – At a Death Café, folks gather to converse about the many aspects of dying and death, including but not limited to end-of-life paperwork, the multitude of feelings about caring for one who is ill/dying, how good death might look, grieving, celebrating and any/everything else this topic inspires for you. This is not a therapy or counseling group. Feel free to speak or just listen. Or both. Completely confidential. For those who are 21 and over. Refreshments will be available. Please join us. RSVP here with your email address and preferred phone number. Questions? Email Buff Medb Neretin at aurorasilks@gmail.com. (4) IMIrJ (Interfaith Movement for Immigrant Justice) Advocacy Day, Monday April 8, 8:00 am-4:00 pm, Salem – Join Rabbi Benjamin and members of the Sanctuary Committee as we participate in the IMIrJ Advocacy Day in Salem. We will come together with people of faith and conscience from across the state to build relationships with our Oregon state senators and representatives to amplify the demands and priorities of Oregon’s immigrant and refugee communities. A key issue is the Equal Access to Roads Act, which would ensure standard licenses are available to all qualified drivers regardless of their ability to prove their status. Make a pledge to recruit two others in your network to register and attend this important event. Register to attend here. Carpooling is available. Questions? Contact Kathy Gordon (farvergordon@gmail.com), Shari Raider (shari.raider@gmail.com), or Bob Brown, rebrown47@gmail.com. (5) Are You Hosting a Seder with Space for Others? Are You Looking for a Seder? – Last year's matching of members hosting seders with members who wanted to join a seder was so well appreciated that we're doing it again this year, with a few improvements based on feedback from those who participated last year. If you are hosting a seder and have room for a Havurah member, or if you're looking for a seder, please complete the form below. The deadline to sign up is Wednesday, April 10, to give our seder matchers time to connect people with each other and to give seder hosts time to prepare for their seder. (6) RSVP for a Safety Tour this April – Learn all about the safety and security policies and resources at the Havurah building in this brief but informative tour with Office & Facilities Manager Rachel Pollak. Please RSVP if you can come! Questions? Email Rachel Pollak at rachel@havurahshalom.org. (7) Kabbalat Shabbat, Friday, April 12, 6:30 pm Dinner, 7:30 pm Service – Join us for a catered vegetarian dinner at 6:30 pm, followed by a short, musical service at 7:30 pm. RSVP here for the dinner by Sunday, April 7. For cost adjustments, call 503-248-4662 ext. 2. No RSVP is required for the service. Just join us as we welcome Shabbat! Childcare is provided. Make New Connections at Kabbalat Shabbat Dinners – For the next three months, Kabbalat Shabbat dinners will be offering an opportunity for members to meet “new faces” and make new connections within our community. This is entirely optional, we know that these dinners provide a welcome opportunity for many to catch up with old friends. For members who choose to participate, we will offer reserved seating at “New Connections” tables, where you will have an opportunity to talk to someone you do not know, or do not know well. The new Kabbalat dinner form will have a place for you to indicate if you wish to be seated at a New Connections table. For further information contact Susan Lazareck, susanlazareck@gmail.com, or Judy Steinberger, jlasteinberger@gmail.com. (8) Community Forum: Zenith Tar Sands Oil Expansion, Wednesday, April 17, 6:30-8:30 pm (Gathering and tabling at 6:30 pm; Speakers start promptly at 7:00 pm) – The Havurah Climate Action Team invites you to a community forum to learn more about Zenith Energy's Tar Sands Oil Expansion in NW Portland and ways to stop it. Zenith Energy is one of dozens of polluting industries on the banks of the Willamette River. It is expanding its terminal to accommodate four times the amount of oil trains loaded with Canadian Tar Sands crude coming through Portland for export to Asia. This is taking place without public input. Learn more here. (10) Happy Hour for New & Prospective Members, Sunday, May 5, 4:30-6:30 pm, Havurah Shalom – Happy Hour: A chance to connect for new members, new-ish members, prospective members, and all members seeking more connection. In the spirit of Panim el Panim: Encountering one Another, we'll meet face-to-face to shmooze, nosh, kibbutz, and learn about Havurah happenings ... and we'll leave with something "more" in us as we embrace Panim el Panim. According to Philosopher Martin Buber, a face gazing into another face is a moment of "revelation." RSVP here if you can join us! (11) Havurah-Ortiz Center Language Exchange – Would you like to help a Latinx person in our community improve their English? Would you like to improve your Spanish? We can match you up with a language partner! The time commitment is limited, about one hour a week, when you will meet with your partner at an agreed-upon location, generally in Northeast Portland. The rewards go far beyond language learning. Make a new friend, help them navigate the complexities of living in the U.S., learn about their culture. Questions? Contact Deb at debkall2010@gmail.com. (12) Travel through Jewish History and Food the Portland Way, Wednesdays, May 8, 15, and 22, 10:00 am-12:00 noon – Travel the world. (And eat it!) Join Jewish educator David Feder to look at the travelogues of Benjamin of Tudela (900 years ago), Doña Gracia Mendes Nasi (500 years ago), and the Roden family (100 years ago) for a fascinating look into Jewish history that stretches from Spain and German to Persia and China. But this is not idle historical inquiry: we’ll turn primary sources into a lunch menu each day. Portland’s finest food carts will serve up the last piece of our study as we re-create our subject’s travels with our own forage through delicious downtown. If you think history can seem dry, you’ll love this look at our Jewish world travelers. Plus, you can always order the soup. Participants pay for their own food. Please RSVP here by May 1. Questions? Email David Feder at davidfeder@sbcglobal.net. (13) Havurah 40th Anniversary Celebration, Sunday, May 19, 5:00-8:00 pm, Havurah – Havurah Shalom is 40 years old! Join us to celebrate and support your favorite community with shmoozing, food, drink and music! Whether you've been a member for one year or for 40, our party will be a great time to reflect on our history and look forward to the next 40 years! Party is for members age 21 and over. If you aren't available on May 19, you can make a donation to our Mitzvah Moment at the RSVP link below. Questions? Contact Debbi Nadell, debbinadell@gmail.com. RSVP Here for Our 40th Anniversary Celebration! (14) Summer Camps – We know many of you are making plans for your kids to attend camp this summer (local, day camp, overnight, Jewish, secular). Every year, Havurah kids coincidentally end up at camps together, which gives them the opportunity to reinforce the friendships and community they’ve built during the school year. Being with other Havurah kids in the larger community can be a great experience in your child's summer. Learn more here. Exiled to Nowhere will be on display April 5-11 at the Oregon Historical Society. The exhibition continues April 15-May 12 at the Oregon Jewish Museum and Center for Holocaust Education, including additional events. Click here for more information. (2) Little Shtetl on the Prairie: Reckoning with the Past Through Teshuvah, Wednesday, April 10, Noon–1:00 pm, Oregon Jewish Museum and Center for Holocaust Education – Havurah member Rebecca Clarren, an award-winning journalist, will present a free hour-long slide show and talk. Clarren's relatives escaped pograms in Russia and became Jewish ranchers and homesteaders in South Dakota. Throughout her childhood, Clarren was told stories of their fortitude and luck – stories of her uncle "Bronco Lou" and the mikvahs her great-great-grandmother took in the ice-choked creek behind their shack on the prairie. Yet among the narratives that were never shared were stories of the Lakota, their neighbors. In an effort to better understand the truth of the past and possibly find some healing, Clarren, who has written about Indigenous Americans for national magazines such as The Nation, Indian Country Today and High Country News, set out to find the descendants of the Lakota families who were displaced and harmed by the amoral land allotment policies which provided her family with free land. The program, funded by a grant from the Regional Arts and Culture Council, is part of the OJMCHE's brown bag lunch series. Learn more here. (3) Fair-Trade Your Seder – If you want kosher-for-Passover, fair-trade chocolate on your seder table, order it today. Orders must be received by April 5 to guarantee arrival before Passover. As we celebrate our liberation, our fair-trade chocolate bars from Equal Exchange remind us that freedom comes in packages large and small. While we are working for collective liberation and the reform of our world's major systems of oppression, we also appreciate the small steps that protect the human rights of particular, small groups. These delicious bars, available in eight flavors, contain 100% fair-trade chocolate, so you can rest assured they are free from child slavery. Questions? Contact Bob Brown at rebrown47@gmail.com. Havurah Shalom is a vibrant, diverse, participatory Jewish community steeped in Jewish values promoting spirituality, learning, and acts of social responsibility.